Everyone likes these delicious Laddus. It’s very easy to make them at home. It requires only 4 ingredients. 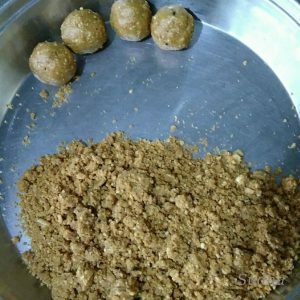 If you already have roasted and peeled peanuts, it takes only 10 minutes to make these Laddus. This could be any time snack or a healthy option for mid morning or evening snack. 1. Add Peeled roasted peanuts and crushed jaggery in a grinder and pulse it 2-3 times till peanuts are crushed. Do not over grind. 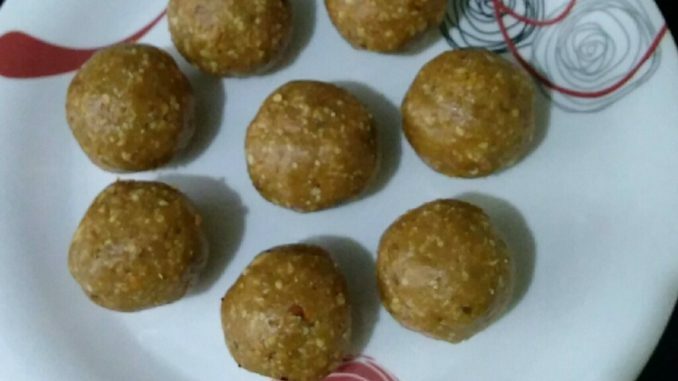 Amount of Jaggery depends on the desired sweetness of Laddus. If you want Laddus to be lightly sweet, then add only ½ cup Jaggery; else add ¾ cup jaggery. 3. Add Cardamom (Eliachy) powder, Ghee and mix using hands. Mixture will be moist enough for you to roll laddus. If not, you can add some more ghee. 4. 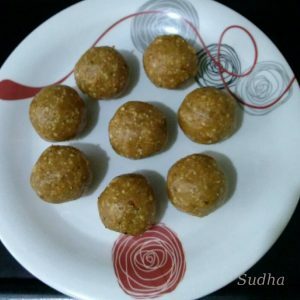 Make bite size laddus. 5. These can be stored without refrigeration for a month. The taste of these laddus will depend on how well the peanuts are roasted. Peanuts should be light brown when you roast them.